I am a licensed, Registered Dietitian in private practice in Portland, Oregon, specializing in weight management and disordered eating. Because I saw a need, I am also trained as a Spiritual Director, a type of counseling that allows interested people to focus on their spiritual experience to discern what is true for them. I guide my clients to greater mindfulness to help them intuitively learn to eat and move enjoyably. I also write in the field of nutrition and health with articles appearing in a variety of magazines. 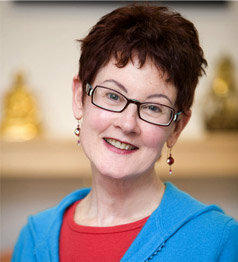 My experience includes teaching meditation and hatha yoga for many years. I lecture widely for professionals and the public. I also worked in weight management research at USC School of Medicine and Kaiser Permanente Center for Health Research.